Torment: Tides of Numenera is the kind of game I used to play when I was kid and I had a friend down the street who got every game when it came out. At a time in my life when I couldn’t afford, nor fully grasp these deep and complex types of RPGs, I played them anyway by borrowing them from a friend. Whether it was Baldur’s Gate 2: Shadows of Amn, or Planescape: Torment, I just fed off the story and hoped I would eventually figure out the rest. Fast forward until now, and with Torment: Tides of Numenera, not much has changed. This game, funded by a Kickstarter, is a callback to RPGs of old on the PC that would rip off the training wheels and give you a story that makes most other narratives pale in comparison. Does it sweep you up in a wave of awesome world building, or will you drown in these tides? Let’s check it out! There’s absolutely no doubt in my mind that Torment: Tides of Numenera will be criticized for its story. As a spiritual successor to Planescape: Torment, this game takes place in “The Ninth World.” It is a billion years in the future, after countless races and civilizations have risen and fallen. While I wouldn’t go so far as to call Torment a horror game, it has a lot of horror elements. Whether it’s the unfathomable beasts hunting you in your own mind called “The Sorrow” or the settings that take you quite literally into the belly of the beast, across the resting place of countless fallen warriors, or into the headquarters of the cult, there’s always something unnerving going on in this game. You play as “The Last Castoff.” You are the product of someone known as “The Changing God.” This person has learned to cheat death by constantly switching out his body for a new one when he gets bored. The bodies he discards, known as Castoffs, then become their own sentient beings. They awake like newborns in a full-grown body with unique powers given to them by their sire. Your goal is to find out more about yourself, about your brethren, and ultimately what your purpose is in this insane world. Torment: Tides of Numenera also lends a lot of story time to your companions, and to the control you have over the narrative. From the opening moments of the game, you’ll be making more choices than every Telltale game combined. You’re constantly making decisions that alter the narrative. These choices can get you into or out of conflicts, bring new party members on board, or simply kill you where you stand. Other consequences are more subtle, but there’s a real weight to how you approach every situation. The way the game is always throwing decisions at you, makes me feel like I’m playing a Dungeons and Dragons campaign with friends, and it just so happened to be written by the lovechild of H.P Lovecraft, H.R. Giger, and the legendary sci-fi author of your choosing. The quality of the writing is incredible. There’s a lush amount of vocabulary used for descriptions, and dialogue is handled with a rhythmic precision that always makes conversations engaging, especially knowing that you can exercise your own input to persuade or intimidate the other participant. Besides the insanely complex and deep writing, the story has a remarkable stamina to constantly throw new things at you and new quandaries. It also has remarkable levels of flexibility. Oftentimes, death simply changes how things play out. Game overs are very, very rare. It’s a story that respects your intelligence and engages you at every turn. Even the most innocuous of NPCs will have an incredible tale to share with you. It’s a world to get lost in, and one that I want to explore time and time again. If there’s one major complaint I have with the story here, it’s the lack of a codex or compendium to store your knowledge. A game like this has a world that feels like it was built on countless books, tabletop RPGs, and a rich history from its predecessor. A newcomer will have a hard time keeping track of everyone’s story, the various histories of the strange locales, and the ever-shifting nature of your character’s existence. It’s overwhelming, which is why a codex would have really helped in keeping the information organized. 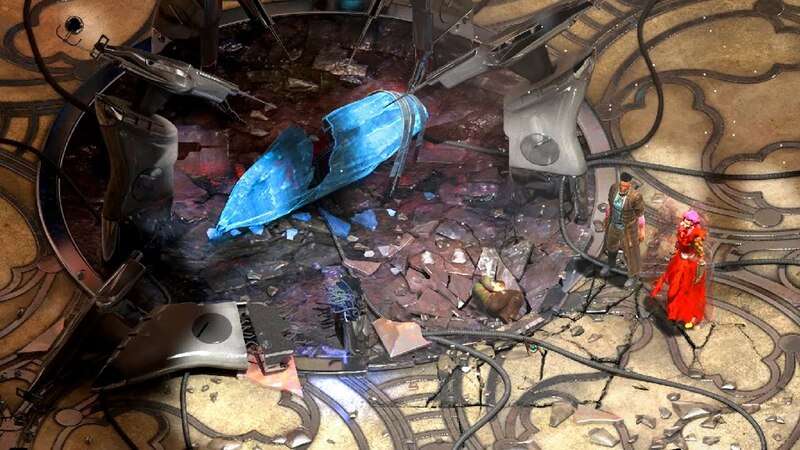 As it stands, Torment: Tides of Numenera throws everything it has at you and it never lets up. You just have to go along for the ride and try to piece the infinite pieces together as you go. I played Torment: Tides of Numenera on a PS4 Pro for the purposes of this review. While I consider my experience with RPGs pretty substantial, the mechanics of Torment will absolutely overwhelm just about any gamer, regardless of their experience. This game takes a lot of different concepts and throws them all together. It’s something where you’re constantly gaining small bursts of understanding, but you never truly understand how it all connects. For example, the game ditches a good/evil system in favor of the titular “Tides” mechanic. These are various forces, named by color, that shift in response to your actions. It’s an awesome way of taking out the duality that most games approach in their morality system, but it’s also different than anything else you’ve seen. Furthermore, while the class creation and equipment menus are pretty straightforward, the intricacies of using items like cyphers, and the sheer amount of options when you level up, are daunting to say the least. On top of all that, you also have your stat pools. These consist of might, speed, and intellect. You have a set amount of each that can be raised as you level up, and they’re used in your decision making to influence the outcome of your actions. Say you want to convince someone that they should let a prisoner go, and you’ve decided to persuade them. You have a 50% chance of success, but you can spend some of your intellect points to increase those odds. Your party members can also chip in and help you as needed. These point pools can only be replenished by sleeping or using consumables. They are key to getting through some of the game’s scenarios. All of that seems manageable, but then you get into combat. The turn-based mechanics can also be altered by your stat-pools, and each of your party members have their own skills, but all of it feels kind of disjointed. Oftentimes, you just end up swinging your melee weapon and hoping you hit. Combat is when all of these differing mechanics come colliding together into a single moment, and that’s when things get messy. Thankfully, combat is often your last resort. The game instead focuses on the narrative arcs and your ability to influence them. If you go into this looking for combat, you’re going to be disappointed in both the scarcity of it, and the overall feel it has when battles do come along. The story is the star of the show. Torment: Tides of Numenera takes a classic approach to presentation. This is both good and bad in the grand scheme of things. On the one hand, you have gorgeous environments that look like they were handcrafted and designed by expert storytellers. On the other hand, you also have very static environments that rarely move, and characters who very rarely showcase any emotion. 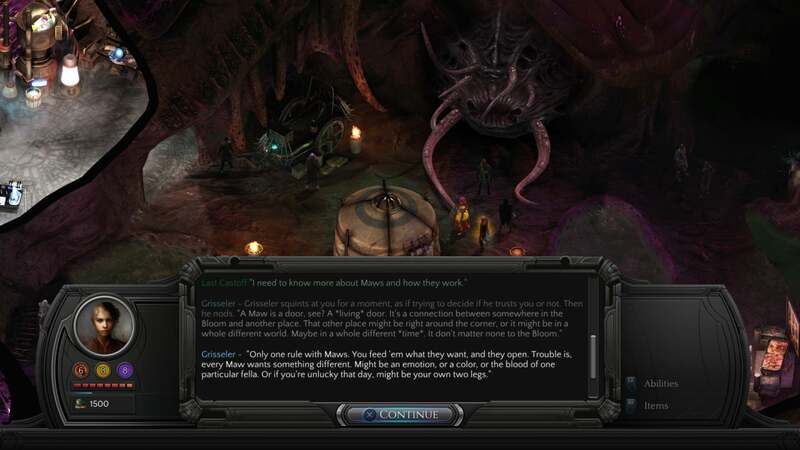 The vast majority of Torment’s storytelling happens in text, with the occasional voice acting. Keep this in mind if you’re considering a buy. This is a game where you will spend most of your time reading and associating what’s happening with the environments on screen. Personally, I liked the combination, and the narrative has enough interactive moments to make it feel engaging. Playing on the PS4 Pro, Torment: Tides of Numenera experiences near constant frame rate drops. It’s not a game that requires any amount of precision, so this doesn’t ruin the experience by any means, but it does feel very clunky. Despite the issues I have with the battle system, the overwhelming RPG mechanics, and the inconsistent presentation, I still loved my time with Torment: Tides of Numenera. The utter scope of the story and the positively amazing writing kept me pulled into its world, despite the blemishes the game has. If you’re okay with avoiding combat as much as possible, and you can deal with learning tons of new systems from the ground up, you’ll find one of the most complex and well-written stories in modern gaming with Torment: Tides of Numenera.